Simple OLM File Conversion: User interface is made with such ease so that can perform conversion effortlessly. Advanced Preview Modes: MailPRO+ OLM to PST Converter provides multiple advance preview modes such as HEX, MIME, Email Header, HTML etc. Provides Option to locate OLM file when exact location of OLM files are not know to user. Save files in Multiple file formats, through the preferred option remains PST. Additional conversion formats like MSG, EML,PDF, CSV, HTML, TIFF etc. are also available for user-preference. MailPRO+ OLM to PST Converter does not requires high-end system specifications for its installation. Works with Windows Operating system and supports 10, 8.1, 8 & 7 edition. Once the specifications equal requirements, download the software and install for successful OLM to PST conversion. Download & Run OLM to PST Converter Software on Windows Operating System. Select Create new collection option to add new one. Convert OLM files to PST software scans & load file in quick time. MailPRO+ OLM to PST Conversion tool provides 8+ preview modes to analyze OLM file in depth. You can also perform e-Discovery on olm data files using software. Select emails files or folder and click on export button given in menu bar. Choose PST format in destination. Apply export options such as Maintain folder hierarchy, exclude duplicates items etc. Browse location to save resultant PST file. Click OK to start process. The migration of one email platform to other is sophisticated task. User get confused what to do. In such as highly effective email conversion software is required. MailPRO+ OLM to PST Converter software is only software that delivers 100% result with maximum ease. It provides the preview of OLM Files in more than 8+ modes. 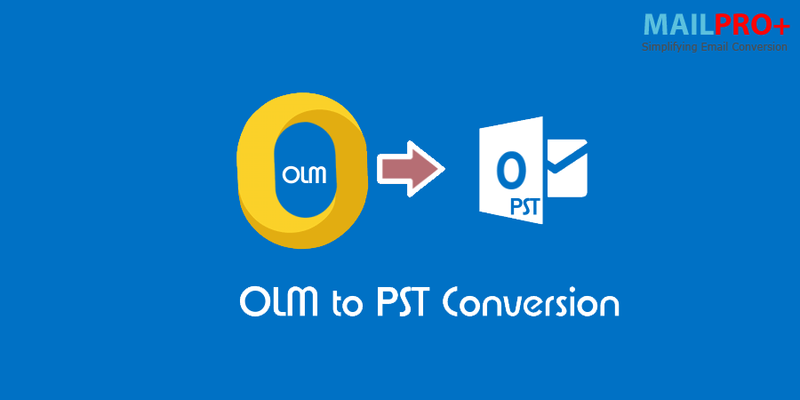 It ensure the complete conversion of olm to Outlook PST in few clicks.